Among the traditional breakfast items, dosa is the most preferred tiffin. 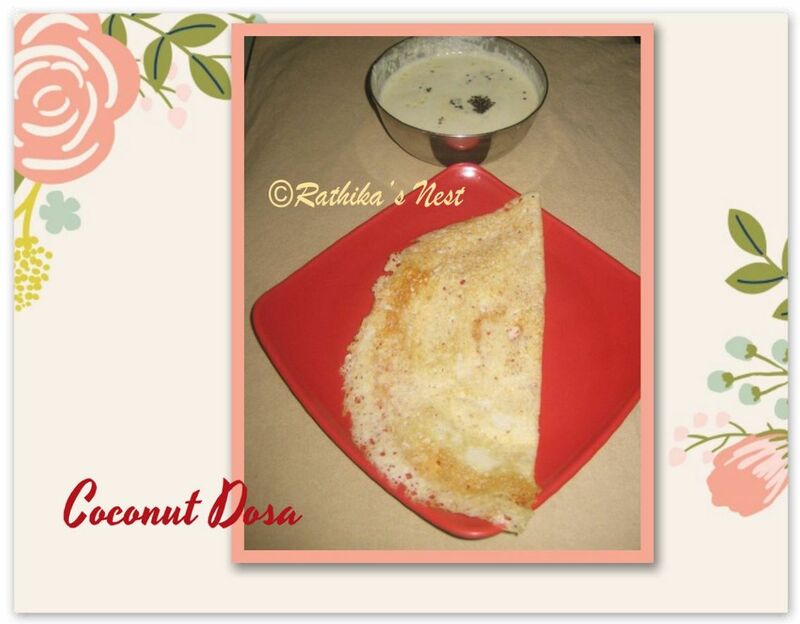 I have shared nearly 25 varieties of dosa on Rathika’s Nest so far. Primarily the difference in the batter changes the consistency and taste of the dosa, though the method of making dosa varies with some dosa varieties. Today, I wish to share with you how to make a soft, tasty dosa called coconut dosa (தேங்காய் தோசை). Method – How to prepare the batter: Wash and soak par-boiled rice and urad dhal separately in sufficient quantity of water for 4 hours. Drain the water later. Grate the coconut and keep aside. Just before grinding, wash and soak rice flakes in 1 teacup of water. First grind the urad dhal with enough water into a fluffy mass using a wet grinder. As you keep grinding, add half the quantity of soaked rice to the ground dhal little by little. Drain the water from rice flakes. Next add the rice flakes to the grinding batter. Now, add the remaining soaked rice. This way, rice flakes blend well with the rest of the ingredients and do not stay as tiny lumps in the batter. You may add water as needed. Finally, add grated coconut, required salt and grind into a fine paste. Switch off the grinder, and transfer the batter into a wide mouthed vessel. Let it ferment for 8 hours. How to make the dosa: Heat the tava on medium flame. Pour one large hollow ladleful of batter on the hot tava and spread into a thin dosa. Add oil along the edge of the dosa. When the bubbles appear on the surface, turn the dosa over and cook the other side. Your coconut dosa is ready. It is soft and has the gentle taste of coconut. Make as many dosas as needed in the same way. You may store the remaining batter in the refrigerator and use it later, for 2–3 days. Serve hot with coconut chutney, tomato chutney or any other chutney of your choice.